Today is our last day together for our week of love. I really hope you have had fun and enjoyed the layouts and other ideas. Valentine's Day is all about love. And is a terrific excuse to put together a page celebrating the love you feel for that special person in your life. Now that I have a babysitter in the house, I get to go on more dates than we have in years. After years of babies and diapers and sleepless nights, it is nice to have a bit of a reprieve. I know there are more sleepless nights ahead with teenagers, so I am trying to savor these next few years and to rekindle my love affair with my husband. It's been a long time coming. A bit ago, I tried to put together a page to talk about my feelings, but there were no serious photos to be found. None. And honestly everything I was trying to say sounded oddly insincere in written form. So instead I chose to create a wacky layout that represents us in all our crazy. This first photo was taken during our annual Mother's Day photo shoot. Rich started with the "wedding" pose where he stands behind with his arms around me. (We do our best to emulate awkward family photos!) And then suddenly he was being a vampire. So I put on my best scared vampire-is-attacking-me eyes. And it made a great starting place for a layout about us not being too serious. This next photo is oh so awesome. The kind you can't believe you actually got! I thought it would make a terrific layout photo. And let's me talk about another something that Richard and I have in common. Silly though these photos and layouts may be, I love them! And I think they do a great job of capturing our relationship, even if they aren't filled with expressions of love. 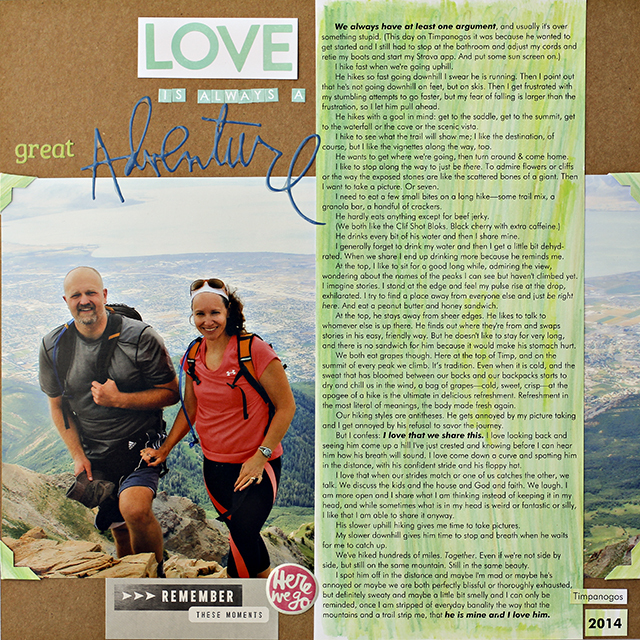 Diane's layout shows us that you don't need a column of journaling to get your point across. I love all the hearts on this one. That, itself, was a labor of love. This next layout just makes me smile. Maybe because it was a taken at an amusement park (see above layout of mine!) or maybe because they just look so very happy. 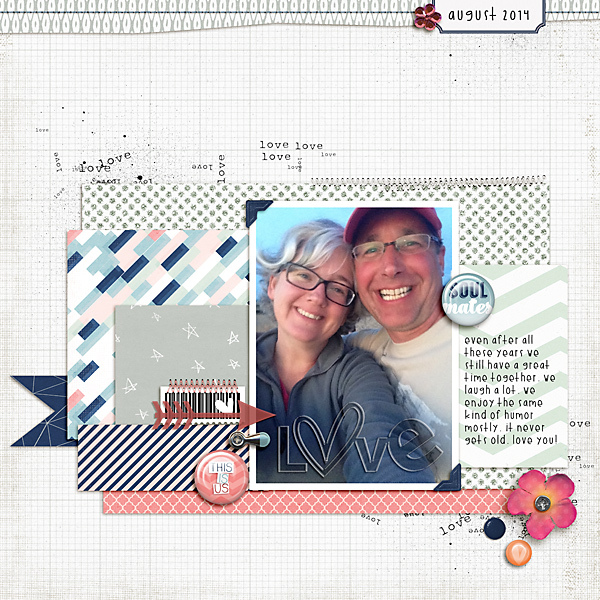 Diane's next layout, My Funny Valentine, is aptly titled and would be easy to recreate. Combine a date night, a phone for photos, and a willingness to ham it up with some patterned paper, buttons, and hearts, and you have a great layout waiting to happen! And this last one from Diane just makes me swoon. The feathers on the arrows are fabulous! And I am totally going to do a photo shoot in my backyard just like this! Amy has a clever journaling idea: a list. Even knowing how helpful they are for succinctly capturing what I want to say, I still forget to use them. Thank you, Amy for the reminder. A list of reasons why I love my sweetheart would be the perfect non-smarmy way to capture my feelings. I love Amy's next layout as well. The embellishment that says, "you are everything" says it all. Thank you, again, for stopping by today and for spending your week with us! I hope that you had a great week. Lisa will be here tomorrow for a new photography article. Hope to see you then! Welcome to day four! I hope you are having a great week! We have made a mini album, some class Valentines, and some pretty decorations. What's left you are wondering? Why, layouts of course! Layouts to document the festivities, the traditions, and a few to express our love. 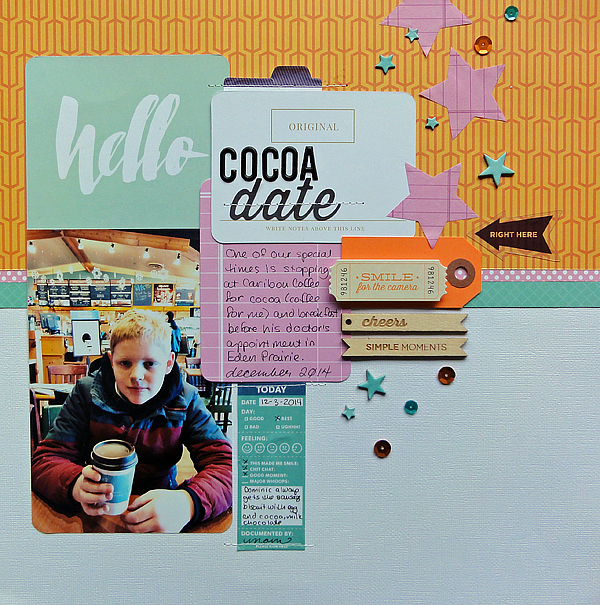 Today we are focusing on layouts and photos for our kids, and tomorrow for the grownups. For my kids, the celebrations begin when the fill out their Valentines. I try each year to get a picture of them signing their name to the stack of Valentines for their classes. 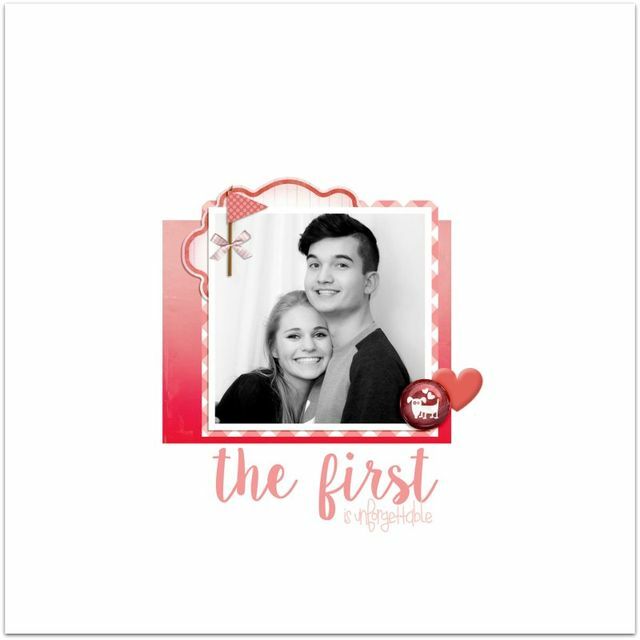 Christa used her daughter's Valentine signing photo as the starting point for this darling layout. If you miss the actual signing, you can always just get a picture of the signed Valentine. Do your kids make mailboxes to take to school for their class parties? Mine do and I love them. I leave them to their own devices, armed with glue, paper, punches, and glitter. I'm hoping that as the years pass, these records of their handiwork and penmanship will become all the more special. Then, of course, there is the party. If you can't make it to the party yourself, be sure to ask the teacher to send you some pictures. Most will take them. Do you have any family traditions? I have not one sweet tooth, but 32 of them. Valentine's Day at our house includes frosted sugar cookies, and a card from Grandma, and this year, our new tradition of the love notes. AmyS's family has a similar cookie tradition. And if Valentine's Day isn't your thing, consider it an excuse to put together a layout of love. Love letter pages are my favorite. Seeing these inspired to do one of my own. The tags on this one were inspired by former wcs collective member, Linda Barber. Thank you! For stopping by and for your giving us a reason to be here. We do love you and appreciate you! Tomorrow we close off our week. Hope to see you back! Thank you for coming back for day three in our Valentine's week celebration! 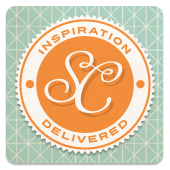 Today we are focusing on ways we can use our supplies and talents to help bring a little love into our home decor. Katie is up first with a sweet and simple banner. Made with dictionary paper, patterned paper hearts, a few beads, and some ribbon, this is something that we could all make! If you look closely, you can see the ribbon is stapled on. Diane is up next with a bit of loveliness for your wall. A printer tray would work well for this, no? I love the hanging heart with a key. It makes it almost feel like a cuckoo clock--one of my favorite childhood fascinations. If you have a lonely shelf, Katie's birdhouse would be a terrific spot of color and design. Have you stopped by Lisa's blog lately? If you did, you will certainly have noticed her intricate craftiness in this pieced and quilted paper heart. Here is a closeup so you can see just how carefully and perfectly it is put together. Lisa, you are amazing! Speaking of intricate details, Francine cut up little bits of paint chips and arranged them as a mosaic inside the outline of a heart. You can see the names of the colors on this shot. I bet lots of us have a stack of these from a few years back when we all thought we should put them on our pages! Kelly had a delightful date with mod podge this week, and we are so glad! What treasures these will be year after year. Kelly also created a fabulous wall canvas. Book papers, stamps, buttons--things we all have on hand. Isn't it lovely? I also spy a sweet garland in the photo! Strung together with little rings. I love that, too! LisaO made a most wonderful gift for her daughter. Using a Sharpie, she wrote all sorts of things she loves about her sweet angel on this mug. Just don't forget to bake it at 350 degrees for an half hour! Lastly, I did what I do best, used some fonts and graphics to make a poster for a frame. Here is mine. I hope that these give you some ideas for adding a bit of love-ing love-liness to your love-ly homes on this day of love! The first year that Nigel went to school I sent him in with homemade Valentines. And he came home with a box filled with store bought Valentines and treats. Yes, treats. I had no idea that Valentine's exchanges included treats. I only made that mistake once!! Now, every year, I make a printable valentine, and we make treats to give. One year we made brownies, cut them into hearts and put a cherry juju heart on top. Mmm. The next year, was brownies again. Though I suppose cupcakes might have been expected from the design we picked for the valentines. This year my Lavender's class is not going to be brownies. She has sixty four allergies in her class. No, I'm teasing. Not that many. But she does have dairy, egg, wheat, tree nut, and coconut oil allergies. The list of food options is small so we are taking the easy route, fruit. I test drove all sorts of "pun-ny" sayings but ended up with the expected oranges and apples. Not too creative, I know, but will still make for a cute enough treat topper. If you would like to use either of these valentines, you may download them here (oranges) and here (apples). Once I made one (two :) ) corny treat toppers, I couldn't resist doing one for the non-allergy class as well. They should attach wonderfully to this year's brownie selection, what e'er it turns out to be. And would you like it? It's here if you do. 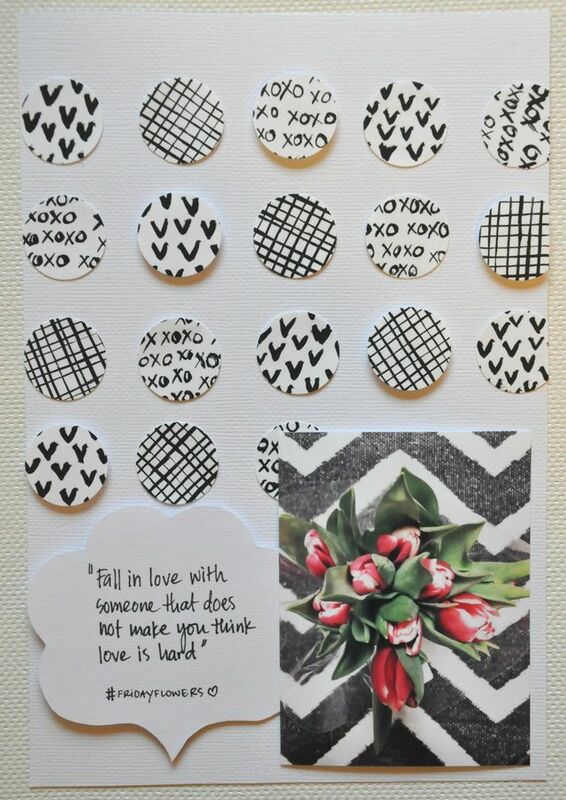 For her sweet littles, Katie cut double heart cards with her Cameo. Then the girls glued them to doilies, embellished them, and wrote their names on the insides. I love how girly they are! A perfect fit for her bitty darlings. Francine has a two fun ideas for Valentines you could make with your youngster. These Valentines were made from paper handpainted by her little boy. Clever, no? Or you can just paint the whole hand! Finger painting at its finest! Have you planned your Valentine's class cards yet? I hope these ideas help you with your class cards! Thank you for stopping today! I appreciate your coming by. Tomorrow we will feature a bit of home decor. Hope to see you then! Hello! It's Marnie and I am so very happy to be spending the week with you! This week we are getting ready for Valentine's Day. Today I have a little family craft for us to do together! I wanted this year to be special and have a bit of a different twist. So for the next ten days we are filling out lovenotes for one another. I created a set of notecards for everyone in our family (mom and dad are together!) with the same pattern, but different colors. and here is how all four sets look together printed out. I want this project to be successful, so I put a card station together with all the cards and some pens. It sits on the little project table, within everyone's reach. Each set of cards is divided upon separate plates. The mailboxes are sitting on the cupboard just to the left so that they will be easily accessed. We are going to read the lovenotes as a family on Valentine's Day. And then a few days later, I am going to put them together in a minialbum. I already put the title on one of the cards to make even easier! I am excited for the handwriting and the memories that this will record, and equally excited to see what everyone writes and to see the impact of two weeks of kind thoughts at the end of the day. The printable is available in our new etsy shop! Stop by and visit. You can pick from any of the four colors. Or get all four! How about you? Have you any thoughts about how you will celebrate Valentine's Day? I would love to hear them! Please stop by tomorrow. We are doing class treats tomorrow!